simple and clean mag styled web design that comes with a fresh flat stylehaving a great responsive design that supports many electronic devices includingmobile phones and computer PCs etc. This web theme is undoubtedly perfect formagazine, News or for Personal websites. It has a great looking structure that isfully user-friendly, moreover, it is advanced Optimized for search engineoptimization on SERPs (Search Engine Result Pages). It has Post by Labeloption, Flat UI Interface Style, Google Fonts and much more other greatfeatures have been added in this latest pack. 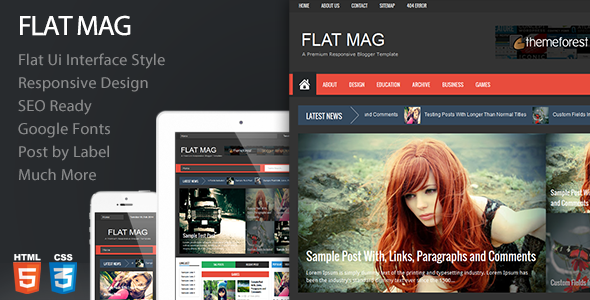 Flat Mag Responsive Blogger Template is a multi-purpose straight Blogger template precisely designed for multimedia, news bulletin, Entertainment and Technology blogs. With an elegant green color scheme, FlatMag gives your visitors the experience of their life as they go through the responsive and flexible design. It has a lot of useful and key widgets, which come which are ready-to-use from the time this template is installed on your blog. Following are the few key features we have incorporated in this responsive blogger theme. Responsive Design: It has a responsive design which automatically fits different resolutions i.e. iPad, iPod, Android and etc. (Try resizing the page of your browser and see the magic). This theme is coded so perfectly that it is highly responsive in even Internet Explorer. Sticky Header with Dropdown Menu: In this theme, we have used “Sticky” drop-down menu, but a lot of users demanded a Multi Drop Down menu which could work on three different sub-levels. Keeping that in mind, we have added a “Sticky”, Multi-level Drop down menu in this theme. On the top of that, the header of this theme is also sticky. How To Customizing Sticky Menu? How to Customize Featured Content Area? We hope this responsive template would help your visitors to make most of what you have for them. This theme takes a few seconds to load and has a good enough page speed score. Let us know what do you think about it.